A summary of the gear I use in making my videos. It's clear at first glance that I like two brands in particular: Canon and Rode. I've yet to be steered wrong by either company, and I'd honestly recommend them to anyone looking to get into film making. The below is only a subset of all the gear that I use: not mentioned are tripods, sliders, drones, software, cards, and other bits and bobs. If there's demand I will add them to the page, but for now I'm only including the big things that I use in nearly every video. My workhorse vlogging camera for the majority of my videos - I've recently replaced this with the 80D but this thing is an absolute joy to work with. Great stabilisation, small size, and a surprising list of features including time lapses, shooting at higher frame rates, and a decent optical zoom. This thing is ideal to vlog with or use as a B or C camera in a pinch. I used a Mk I, which you can get on Amazon here, but you can now also get an improved Mk II. My latest purchase in the camera department, the 80D has fantastic follow focus and a crisp image even with the kit lens. This combined with the sensor size makes it a significant - if expensive - upgrade to my previous vlogging camera, the G7X. While it does lack stabilisation, the image quality is good enough that you can use it as an A camera on other kinds of shoots such as music videos and interviews. The timelapse mode is also a personal favourite, and I'm still discovering new features to use all the time! You can get it on Amazon here. My go-to A camera. Mine is a battered mk II that I got second hand on Amazon, and it's received more than its fair share of knocks over the years. But when combined with the right lens (see below) it produces an image quality that you just can't beat - the sheer size of the sensor and the dynamic range it captures even in an mp4 give it a nearly cinematic look. Definitely not one for vlogging or even shooting videos by yourself (unless you have a fancy trick like an IR remote to pull focus) but if you're shooting a feature video with others, such as an interview, it's tip top. You can get it on Amazon here. Note that you can also get the newer but much more expensive mk IV. A beautiful, beautiful lens that is amazing when paired with the Canon 5D above. Pretty much perfect for portraits when used with an EF mount, I use this wherever I can for medium-wide to close shots. It's too heavy for vlogging, but I'll use it for basically everything else. You can get it on Amazon here. The 'nifty-fifty' - if you're using a Canon DSLR you need this lens. It's dead cheap, the low f-stop gives a cinematic depth of field, and when combined with the 50mm prime focal length is perfect for shooting individuals in a medium close up. I wouldn't recommend it for vlogging as it's a prime lens, but for basically anything else involving humans it's a must-buy. You can get it on Amazon here. Probably the single best buy of my entire film making career, this has been used in all my videos other than vlogs since I bought it. Allowing you to use two XLR inputs along with the two onboard stereo mics, this thing has been used on everything from interviews to science videos to concert recordings. The versatility and low price point make this an excellent buy for anyone looking to up their audio game. I highly, highly recommend it. You can buy it on Amazon here. My go-to microphone. Being a shotgun mic it's seriously versatile, though you do have to know what you're doing in terms of positioning: the closer the better! Wherever possible take it off the camera (if you have a mount for it) and either conceal it in the shot or boom it in from above. 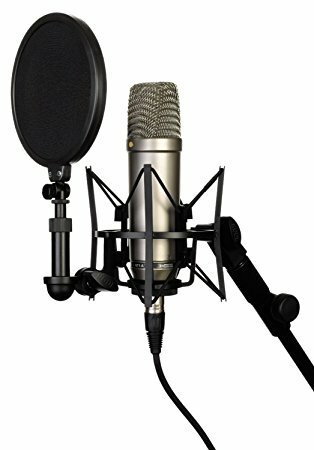 It's great for general vocals or as backup audio, in a pinch it can even stretch to being a podcasting mic (with lots of processing). The stepup from piping audio in to a 3.5mm jack on your camera is a big one - again this is a great buy if you're looking to up your audio production values. You can buy in on Amazon here. The best option in my arsenal for vocals. This is what I use for voiceovers, podcasts, and singing. Its large diaphragm means you get an excellent frequency response so you get a very ASMR-y sound. Not too expensive, this is probably my favourite microphone. You can buy it on Amazon here.